got some on the way and already have a few. what tools are best for things like chainmail ? and where in the uk stocks them. any other tool tips and sculpting tips would be appreciated as i\'m taking the plunge and having a serious go at it as soon as my fimo etc arrives. I think I saw an article where real chain was used. Your mate Tim has found that the Cheap jewellers in the main shopping street down from Rylands Stationary is selling 24\" silver fine chain for a couple of quid. EDIT: I can\'t type tonight. I filed hypodermic syringe, so you get a \'half moon\' shaped tip. Works a treat! That was taken from a discussion on \' Hostorica Forma\' from those historic types. the tool I use is a needel with nothing more than a bent tip. Heated it on the stove and bent a slight hook. Then use it to pull the putty in the ring shape. Google sculpting chain mail there\'s many online tutorials. what tools are best for things like chainmail ? Other than a particular type of detail like mail texture anything else specific that you\'re concerned with (rather than just general shaping, which is very much an \'each to his own\' type of thing)? Don\'t use Fimo :beer: Okay, on a more constructive note: do be sure to try epoxy putties too - some people get on much better with one type rather than the other and there are things you can\'t do with a putty that has give because it hasn\'t been baked yet. Incidentally you can mix the two types in case you didn\'t know. If structural strength isn\'t much of an issue it\'s well worth trying in case 2 hours or so per section feels like you\'re having to rush. 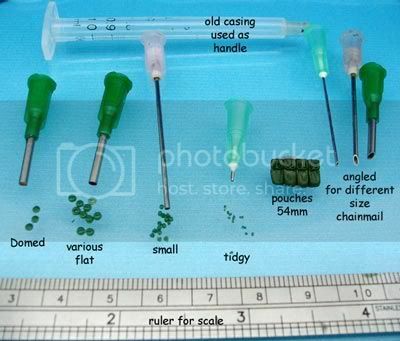 what size do i need as all the needles i have looked at give the size as 1\" or 5/8\" ??? lol i don\'t have a clue where in bolton rylands stationary is, i\'ll ask tim as i\'ll be in town on thursday. @Einion, cheers bud, appreciate the info/advice. Welcome, do be sure to try to lay your hands on some MagicSculp at some point, beats the pants off Milliput or GS for a lot of people. Pure GS (at various blue & yellow proportions) does take a bit of getting used to! Once you get more used to sculpting and pushing putty around it gets a lot easier to use IME. I don\'t get on with Fimo and other polymer clays I\'ve tried (and not just for small-scale work like minis), be interested to see what you think of it with your Plasticine experience. Plasticine v clay, I\'m not sure if I really prefer either as they\'re so different. BTW, I\'ve played around with blending the newer type (Plastiline?) with epoxy putty, just enough added to get it to set reasonably hard while still being a lot like it is by itself. For a one-off piece it could be something to try. hey donga, where can you buy the needles in quantities of less than 100?